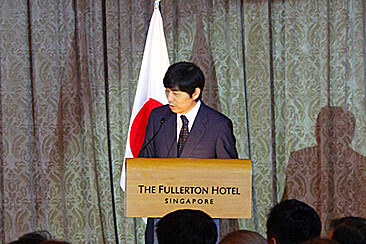 The Embassy of Japan in Singapore celebrated the 80th Birthday of His Majesty the Emperor of Japan on the 10th of December at The Fullerton Hotel. 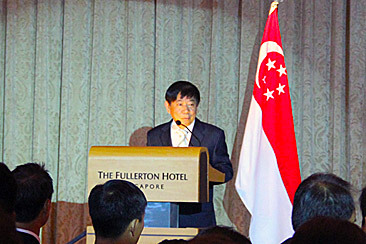 Minister for National Development His Excellency Khaw Boon Wan, Member of Parliament Mr Baey Yam Keng, Member of Parliament Er Dr Lee Bee Wah, Singapore Air Force Chief of Staff-Joint Staff Brigadier-General Tan Ming Yiak Mark, and many other distinguished guests attended the event. 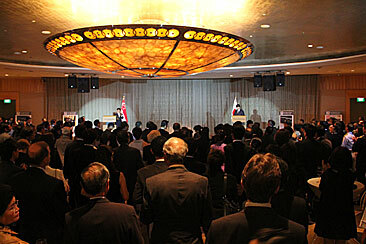 Food and beverage producers from Japan kindly offered their specialties at the reception. There were rice and Sake from Iwate prefecture, green tea and Sake from Ibaraki prefecture, green tea and melon from Shizuoka prefecture, plum wine from Wakayama prefecture, Sake, apples, and simmered black beans from Nagano prefecture, blue-fin tuna, yellowtail and hardtail from Kumamoto prefecture, kumquat, Dekopon Mandarin, and sweet potato from Kagoshima prefecture, Sake from Miyagi Katsuyama brewery, Japanese wine from Yamanashi Grace Wine, Wagyu beef from Japan Wagyu Beef Export Promotion Committee, and Japanese beer from Kirin Beer. 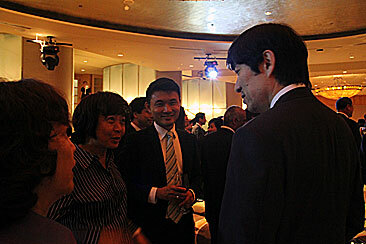 We also received the kind support from Singapore Sogetsu Association for their Ikebana exhibits, and from National University of Singapore Koto ensemble “KotoKottoN” for their Koto performance at the reception.